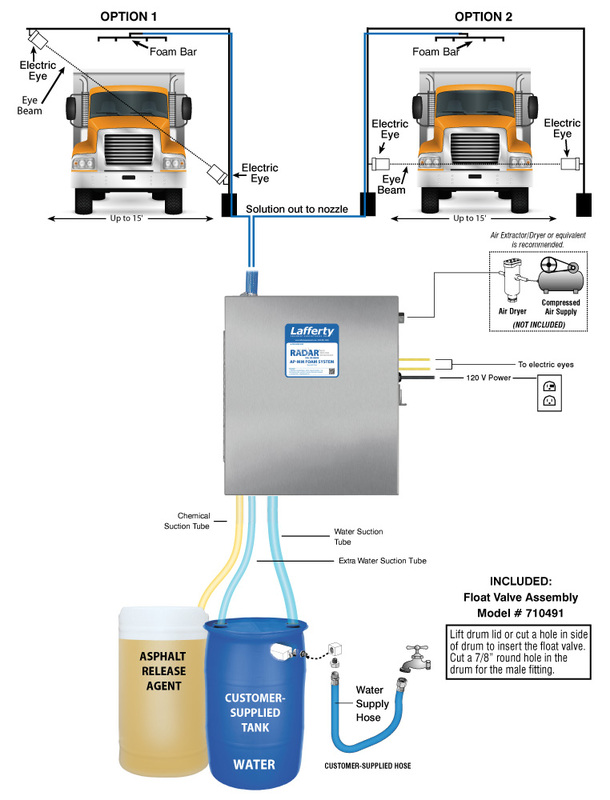 RADAR AP-MM Asphalt Release Foam System | Lafferty Equipment Manufacturing, Inc. The RADAR AP-MM Asphalt Release Foam System is an electric eye activated foam applicator that mounts to a user-supplied drive-though arch for applying asphalt release chemicals to truck beds. It is designed for facilities with low or fluctuating water pressure. This system uses compressed air to drive a rugged Sandpiper air-operated, double-diaphragm pump which draws chemical concentrate and water from separate static tanks and blends them "on-the-fly" to create an accurately diluted solution. Rich, clinging foam is created by injecting compressed air into the solution to greatly expand volume and coverage ability. When a truck breaks the electric eye's line-of-sight, a delay timer allows the driver to position the truck under the foam bar before foaming begins and a run timer applies release agent for a pre-set time or until the vehicle leaves the foaming area, whichever is first. The rugged Sandpiper AODD pump draws chemical concentrate and water from separate static tanks and blends them "on-the-fly"